Are you ready for all things Christmas?! I certainly am! 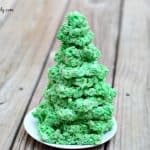 I’m especially ready when it comes to the fun treats and these Christmas Tree Rice Krispies Cake is no exception! With each new Kellogg’s®Rice Krispies® treats as a new bough of the tree, it gets built right before their eyes. This is a sponsored post written on behalf of Kellogg’s®Rice Krispies®. My girls really found their love of marshmallows this summer. I think it was all the fire pit marshmallow roasting we did. It’s as if they thought marshmallows were a meal in our house. 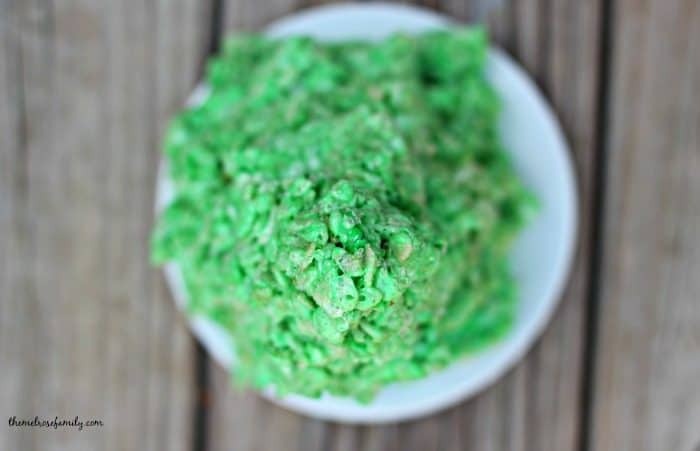 I took them away for a bit, but I’m certainly ready to bring them back for these Christmas Tree Kellogg’s®Rice Krispies® Cake. It is going to be one of the simplest cakes you ever make , but it is simply stunning on a dessert table. Have you ever played the game Jenga before? Each layer builds to the puzzle. When you play the game you try to take out a block without knocking the whole things down. Our Christmas Tree Cake is similar in that the girls get to build it. Each Kellogg’s®Rice Krispies® treat represents a new bough on the tree. When you build this you want to start with the largest treat on the bottom and work your way to the top by using smaller Kellogg’s®Rice Krispies® treats as you go. You will also want to alternate the treats so the points stick out from all different sides. In other words, when you look down at the tree it looks as if there are tree branches sticking out from all different angles. To achieve this shape, rotate the Kellogg’s®Rice Krispies® one on top of the other as you stack them. 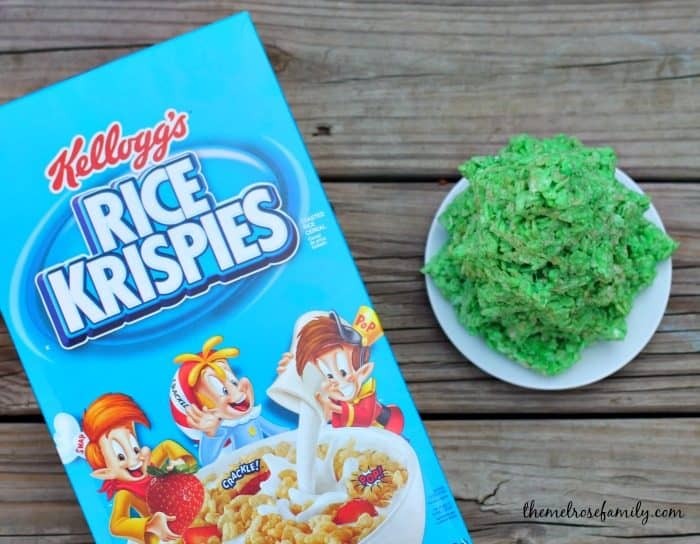 Visit #RiceKrispies Twitter and Pinterest pages for more creative recipe ideas! Looking for a quick and super cute Christmas dessert? 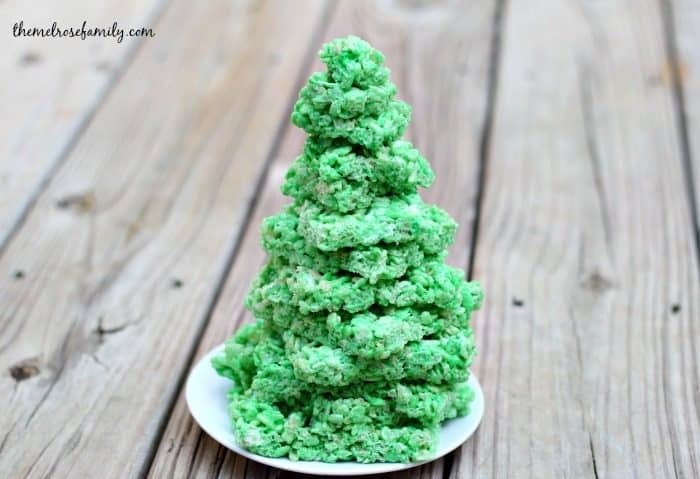 Our Stacked Christmas Tree Rice Krispies Cake comes together in minutes and everyone loves it! Add Kellogg’s® Rice Krispies® cereal. Stir until well coated and then add in the green gel food coloring. In a baking dish press the Kellogg’s®Rice Krispies® onto the bottom so that they can each be cut into smaller and smaller pieces. Stack the Kellogg’s®Rice Krispies® one on top of the other working from largest to smallest and rotate each one so that different edges stick out. Looking for more ways to get in the holiday spirit? For every photo of a Kellogg’s® Rice Krispies® Treat shared, using #Treats4Toys, Kellogg’s® Rice Krispies® will donate a gift to Toys for Tots to help give a little joy to a child in need. Oh yes ! I’m into Christmas Trees ! Love the idea ! Thank you and have a pleasant day !